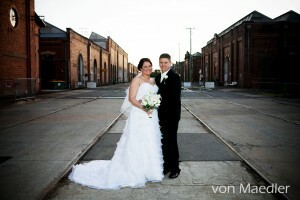 Jacinta and Philip organised a wonderful wedding which was held at the Workshops Rail Museum in Ipswich. They invited close friends and family to help them celebrate their wedding day at a one-of-a-kind venue. Full of rich local history, this is an ideal wedding venue as there are so many great photo opportunities, with old trains and brick buildings. It is also convenient for your guests as you can have both the ceremony and reception at the same location. We hope that Jacinta and Philip enjoyed their big day and will be able to cherish their wedding photos for a lifetime to come together.